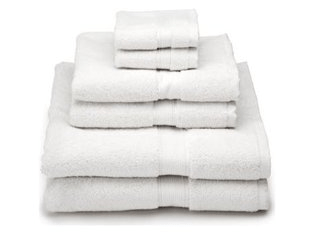 We have primarily white towels in our house. When we got married, I decided that white would be the best option because they can fit with any colour scheme and can always be bleached to get out tough stains. This proved to be a great strategy and now 17 years later, we still have “whitish” towels. Of course, some have been replaced over the years, but generally speaking, they’ve really held up well. Having said that, they certainly aren’t the vibrant white they once were. I was intrigued by this “pin” on how to recharge your towels and knew I would have nothing to lose. I actually don’t have before/after pictures for this post as I didn’t think of it at the time. I chose to do one load of older towels that were definitely looking more of an off white/greyish colour than the pure vibrant white they once were. I followed the instructions and was pleased with the results. I think this would work awesome on towels that weren’t quite so old, as I can’t say I noticed much of a difference in the colour after the treatment, but I found that the towels seemed very clean and fresh and I will absolutely do this a few times per year to freshen up older towels and help keep the nice bright colour of newer ones. The original instructions on Two Little Frills suggested washing the towels twice without any detergent. Using hot water, add 1 cup of vinegar to the load and wash. When the cycle completes add 1/2 cup of baking soda to the second cycle and wash again. *This can also be done with a front load washer by adding the vinegar and soda directly in the drum (not in the dispenser). Remember to do it in two separate cycles. The poster says this works well on clothes and coloured towels as well. This was a great tip and I plan to do it again, unless perhaps my next test works better. I found another post that claims to eliminate the nasty dish rag/towel smell forever. I’m completely all over this. Don’t you hate washing your dish cloths and towels only to have them emerge from the dryer as stinky as before. I absolutely hate that and it burns me when I have to toss out what would otherwise be a perfectly good rag. I’m waiting for the perfect stinky load of rags to test this method against the other post I found. I’m actually looking forward to finding the swimming towels rolled up in a ball in the bottom of the swimming bag, just so I can test these two theories out. Three cheers to clean and fresh!